Following the Law is the sequel to the Larry Cohen's classic book on the Law of Total Tricks: To Bid or Not to Bid. In Following the Law Larry Cohen discusses more complicated hand types, and further adjustments that are needed based on double fits, honors in the opponents suit, and extreme distribution. There are also lots of example hands to improve your competitive bidding judgment and so you can test yourself to see if you are a Law abiding citizen. Match your bidding skill against the world's top pairs! So you think you can bid like an expert? Here's your chance to prove it! Try bidding the hands in this book with your favorite partner, and then compare your results with those from the prestigious international pairs tournaments where they were first played. Scoring is IMP Pairs, and is based on the actual datums recorded in each tournament. Afterwards (or instead if you prefer) you get to read Larry Cohen's wry comments on how each of the hands should be bid, and where he and the other experts went wrong (which they frequently did!). 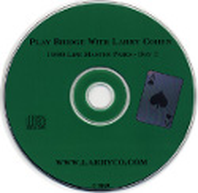 Play Bridge with Larry Cohen Life Master Pairs - Day 1 is interactive software in which you can experience bridge deals as they happened during the 1999 Life Master Pairs played in San Antonio, Texas. During each deal you decide the best course of action to take and then your score is compared against the actual scores among all partnerships during that event. Day 1 takes you through the 56 hands of the actual auctions and hand play while Larry Cohen narrates about the decisions you must make. Cohen's commentary on each hand gives you an idea how some situations are straight forward while others are highly complex. The software provides several valuable bridge lessons for each hand that is played making the 56 deals of Day 1 a great learning experience for players of all levels. Most educational bridge products focus on a theme and the reader can often anticipate the decisions that need to be made based on that theme. However, in this software you are given the real hands that were played and so you will be unable to anticipate a particular theme being taught. Instead you are forced to make decisions on the spot, which is a much more realistic approach to preparing someone for an actual duplicate bridge tournament. After interacting during each hand, Larry Cohen explains his reasoning for the decisions he made at each juncture and explains that tactics, strategies and tips he has used that have helped him win many national championships. Life Master Pairs Day 2 and Day 3 are available to purchase separately. 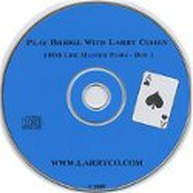 Play Bridge with Larry Cohen Life Master Pairs - Day 2 by Larry Cohen is part 2 of 3 in the series that lets you play the 52 deals from the middle two sessions of the actual 1999 Life Master Pairs event in Texas. Follow along with Larry Cohen as you make every bid and play. After the hands you can compare your score to those of the actual field. As a result the you will see how well you might have done had you played in the actual event. While most beginner and intermediate level players will not score high enough to 'win' the event, the interactive decision making and easy to understand commentary by Larry Cohen will greatly help players of all levels prepare for real world duplicate bridge tournaments. This bridge software program covers many different themes and situations as they unfold during the hand and the user has to figure out the best tactics and strategies. After wrestling with each bidding and play decision on the bridge hand, Larry Cohen offers 'over the shoulder' commentary that can help you understand his expert advice on why he chose what he thought was the best course of action in that situation. 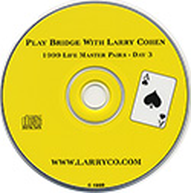 Play Bridge with Larry Cohen Life Master Pairs - Day 3 software by Larry Cohen is the conclusion of the three part series. Part 3 offers the user an opportunity to play the 52 deals from the finals of the 1999 Life Master Pairs event in San Antonio, Texas. Every choice you are presented with is followed by tips and suggestions by Larry Cohen on what he feels is the best decision and why. While most bridge instructional books focus on specific themes, the Play Bridge with Larry Cohen Software offers hand by hand analysis of actual deals during the tournament which makes the learning process much more realistic. With actual bidding dilemmas and the use of various conventions, you will get an opportunity to play each hand and learn the strategies which have made Larry Cohen one of the most accomplished bridge players of all time. The software program is designed to give you the same real life bidding and play of the hand decisions that Larry Cohen faced when he played in the event. Your actions and resulting scores are compared to the field to see how you would have done during this very famous tournament contract bridge event. This software program is designed for all skill levels with analysis that will improve the bridge games of beginner, intermediate and advanced players. Can you play well enough to win the event? My Favorite 52 by Larry Cohen provides a nicely balanced mix of entertainment and bridge lessons. Many players even say that this bridge book is one of their favorites. The very accomplished American bridge player, lecturer, teacher, and writer, Larry Cohen, takes you through the technical aspects as well as his decision process at key moments on over 50 hands. The writing style is aimed at having the reader contemplate what decision to make at the critical moments. After the reader interacts with the bidding and play problems, Cohen then provides his view on the situation. This instructional style is a great way for players to learn the thought process of an expert after they themselves have had a chance to think through each aspect of the deal. This is a book that is often reread by players because of the technical analysis which can really help your thought process when playing bridge especially at an intermediate to advanced level. My Favorite 52 should be read by all serious bridge players. My Favorite 52 software by Larry Cohen is one of the most popular software programs for learning how to play better bridge. As a professional for decades, Larry Cohen presents an interactive course on his favorite 52 hands that is both entertaining and educational. Each hand is guided in a way that allows you to choose your play at various challenging moments during the bidding and play. Since most of the bidding and play problems contain advanced concepts, the software is geared more towards intermediate or advanced players who already have a fundamental knowledge of basic bidding and conventions. During each decision, Larry Cohen offers clear and detailed analysis teaching the mindset and thought process of one of the best American bridge players of the past twenty years. The focus is on learning as you go with interactive quizzes and over the shoulder explanations of every decision. Larry Cohen's teaching system based on real life bidding and play situations has become widely popular among bridge players, and this software program is no exception. In To Bid or Not to Bid Larry Cohen explains the Law of Total Tricks. The idea behind the Law of Total Tricks is that the total number of tricks available for both sides depends on the total number of trumps both sides have in their longest fit. Of course the Law is not quite so simple as there are many times where positive and negative adjustments are required. Larry Cohen clearly explains the basics of the Law of Total Tricks and how to effectively apply the Law in Competitive Auctions. If you have not heard of the Law of Total Tricks or are not sure of how to apply it in competitive auctions then this bridge book is a must read. Once you have the basics down you will probably also want to read Larry's popular sequel Following The Law.